This book teaches frustrated, stressed-out parents that selectively ignoring certain behaviors can actually inspire positive changes in their kids.With all the whining, complaining, begging, and negotiating, parenting can seem more like a chore than a pleasure. 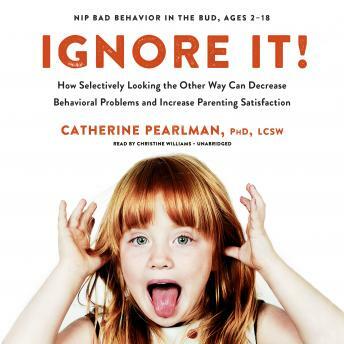 Dr. Catherine Pearlman, syndicated columnist and one of America's leading parenting experts, has a simple yet revolutionary solution: Ignore It!Dr. Pearlman's four-step process returns the joy to child rearing. Combining highly effective strategies with time-tested approaches, she teaches parents when to selectively look the other way to withdraw reinforcement for undesirable behaviors. Too often we find ourselves bargaining, debating, arguing, and pleading with kids. Instead of improved behavior, parents are ensuring that the behavior will not only continue but often get worse. When children receive no attention or reward for misbehavior, they realize their ways of acting are ineffective and cease doing it.Using proven strategies supported by research, this book shows parents how toavoid engaging in a power struggle,stop using attention as a reward for misbehavior, anduse effective behavior-modification techniques to diminish and often eliminate problem behaviors.Overflowing with wisdom, tips, scenarios, frequently asked questions, and a lot of encouragement, Ignore It! is the parenting program that promises to return bliss to the lives of exasperated parents.